It is indisputable the necessity to gather the dispersed industrial and trade plants under a single roof which are still in the process of production with eager to grow with the purpose of configuring systematic and reliable industrialization in the context of city-human-environment orientation and based on Livable environment and sustainable development philosophy. The businesses that are in or near the city cause irregular urbanization and as a result the infrastructure capacity of the city is facing with excess capacity problem. In order to prevent this situation, the special necessities of today are to build special areas, which have the perfect infrastructure, respectable environment and will be sufficient for transport suitably with urban plans and outside the city separated with green stripes which will allow for the industry and trade to develop systematically. To reduce the costs of the regional investor and to make efficient use of the infrastructure services in connection with area of activities, many services can be economically realized, which can be cost advantages due to the fact that they are separated by sub-divisions according to their business status and are grouped together within the region, with other representatives in the business branches and raw material suppliers. It is aimed to increase the productivity through a trade chain instead of the competition and differentiation between the clustering groups of the determined sectors and the companies, to create a synergy that will enable information sharing and communication within the sectors, to provide coalition within the sectors regarding common issues, to become regional attraction center through the diversity that the consumer will tend towards the product they require, to make convenient transportation in the city, to provide marginal benefit in logistic costs of the manufacturer, especially in terms of distributors and for especially small and medium sized companies to benefit from the opportunities and supports of Organized Industrial Zones. 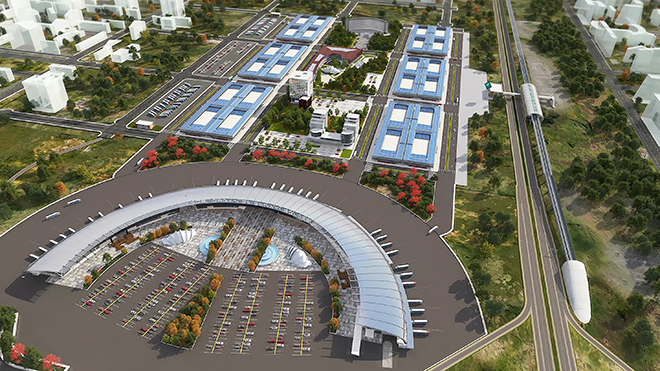 It is estimated that KOBI Organized Industrial Zones is a necessity for the small and medium sized enterprises to be placed on an area of 1.000-5000 m2 confined spaces. This constitution plan aims to increase production and trade by encouraging the capital flow to the region, will create added value by benefiting from regional marketing opportunities, will increase employment opportunities, reduce urban and environmental problems caused by disarray and will have positive influence on productivity growth without competition and differentiation between the clustering groups through a trade chain concerning; Plastics And Rubber, Food, Electricity And Electronics, Construction Elements, Automotive Supplier Industry, Chemistry, Furniture, Coating Technologies, Recycling, Textile, Metal and Machinery Sectors through a successful example and a new approach that will contribute to the future vision of Bursa. Through locating companies in an organized zone will also provide a fair chance to benefit from many incentives and supports. BTSO, which works to provide opportunities to our companies operating in Bursa, is in a position that has taken a mission that has realized projects such as Bursa OSB and Bursa TEKNOSAB which have an industrial revolution value today.